The Black Alligator Leather seat and matching P-Pad is double the padding and is designed to bolt to the existing holes in the frame and fender a passenger pad and bolt to the holes in the fender. This p-pad can be made to match any seat that you would chose if you want a different seat. The pan is made of 1/8 inch thick steel. This makes it a very rigid and strong seat pan, that will be able to take a lot of abuse. The seat measures 12" wide by 13 1/2" long. The studs in the rear are spaced 7 apart. The seat has a dense 1 layer of closed cell foam. The P-Pad 15"x 5 1/2" and is designed to bolt right on your. Sportster using the existing holes in the fender. The nuts and screws to mount the p-pad come with the p-pad. The saddle bag fits all 2004 to 201 3 Sportsters Models. The entire Bag is made of Heavy Top Grain Veg Tanned Alligator Embossed Leather. The Sides of the bag are Reinforced with a second layer of leather that helps the bag keep it's shape. The bag is 4" front to back, 16" wide at the bottom, 10" wide at the top 6" tall on the short side and 10 tall on the long side. The bag is attached with extra high tensile strength zip ties that are fixed over leather traps that wrap around the frame. Bag is designed for Left Side Mounting. The straps, to close the bag with, are 1 wide veg tanned cowhide. The buckles that close the bag are 1 wide heavy duty solid stainless steel. I accept most major credit cards. The item "2010-2019 Fits Sportster Harley Models Blk Alligator Seat P-pad Conversion Kit" is in sale since Wednesday, December 5, 2012. 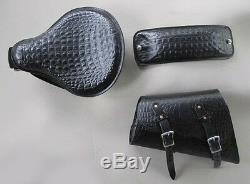 This item is in the category "eBay Motors\Parts & Accessories\Motorcycle Parts\Seats & Seat Parts\Other Seat Parts". The seller is "motherroadcustoms" and is located in Hazelwood, Missouri. This item can be shipped worldwide.